abstract When a suite or script is executed, detailed reports of suite, script, steps and errors are automatically created by Sahi and stored in a database. Reports can be viewed as a web page, or downloaded as offline files in various formats. Reports can also be synced to a central database or between Sahi installations. The appearance of reports can be modified via XSL style sheets. Various other parameters of reports can be also be configured. This shows the Suites List page. Consolidate Report: Click on Consolidate Report to get a consolidated report of Scripts and Testcases of selected Suites. Click on Suite or Script to view the Suite Report page. Suite reports are displayed as a nested tree structure of suites and scripts. It shows the exact nested level for scripts the way it is written in suite / dd.csv file so that user can get the idea of which script belongs to which suite / dd.csv file. Offline reports will also look as nested tree structure. Click on any individual script to view the Script Report page. The steps which failed during script execution will be in shown in red color, with an error message, stating the reason for the step failure. Sahi takes screenshots on step failures and errors. Screenshots give visual information on the state of the application during failure. Click on onScriptErrorDefault to view the screenshot. Clicking on a line in the logs will drill down to exact line in script. To edit the script, click on Edit Script. Sahi Editor will be opened. 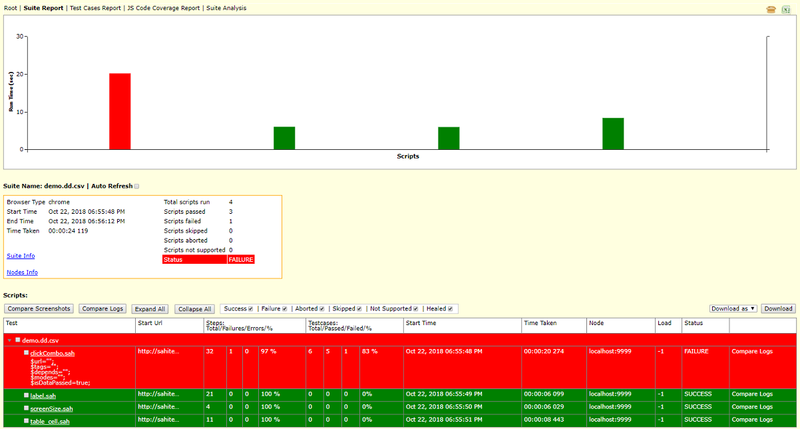 Multiple suite reports can be downloaded directly from the logs page. One can set the report type from the "Download as" dropdown. The reports can be downloaded with varying formats including email, html, xml, excel, junit, tm6. One can also download multiple script reports inside a suite, if there exists any script inside that suite. Check the auto-refresh checkbox to automatically refresh the page to show current status of suite. The logs page will refresh every 2 seconds till the excecution completes. 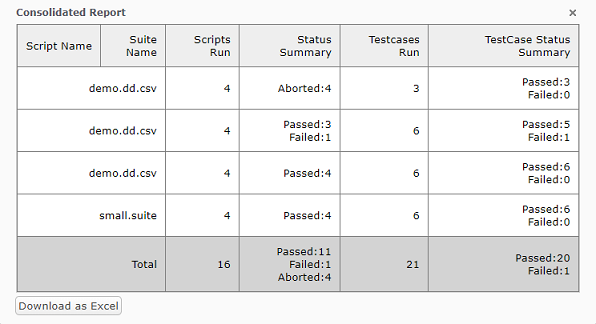 Clicking on JS Code Coverage Report link on Suite and Script Reports pages, shows code coverage reports. 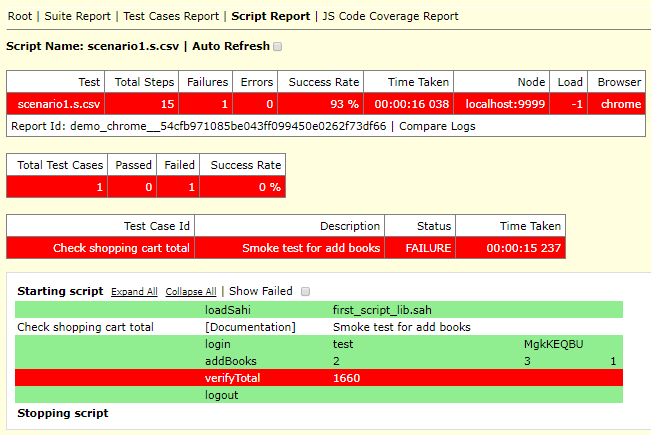 Refer: JS Code Coverage Report section for details. Clicking on Suite Analysis link on Suite and Script Reports pages, shows code script failure reports. Refer: Suite Analysis section for details. 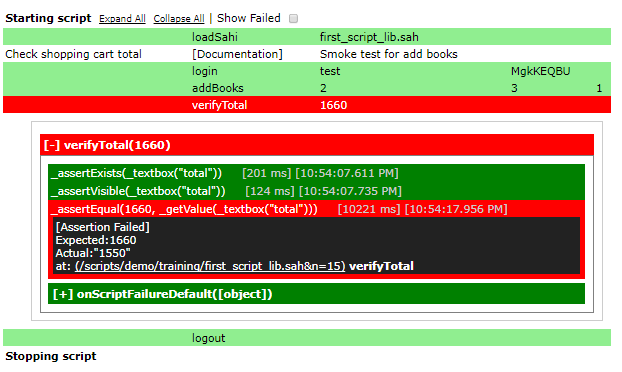 When a script is executed, steps are automatically logged by Sahi. All report data is stored in the database by default. info By default, Sahi Pro ships with XSLs for html, xml, junit, excel and email formats. These are stored in sahi_pro/config/reports/ folder under folders named html,xml etc. Sahi Pro reports can be generated and downloaded in various report types. 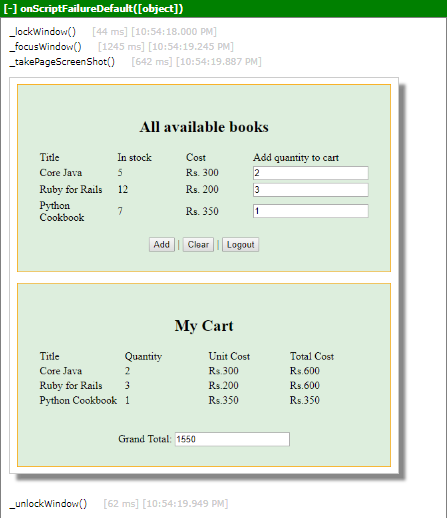 By default, Sahi Pro ships with html, xml, junit, excel and email report types. The words html and xml are not special keywords. These can be defined by the user. 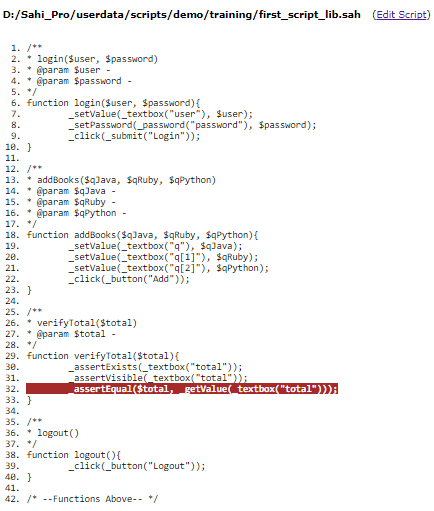 When Sahi sees the logType as html, it will look for a folder userdata/config/reports/html or in config/reports/html. This folder contains various XSL files for transforming data as desired, and a report.properties file. The names of the output files are defined in report.properties Eg. Variables available are <scriptName> and <reportId> and will be replaced correctly in the file names. images.copy tells Sahi whether screenshots images should be copied and images.dir specifies the copy destination folder. For example, xsls for html reports are in config/reports/html folder. To modify existig xsl, copy it over into userdata/config/reports with the same subfolder name. Eg. if you want to modify config/reports/html/suites_list.xsl, copy it such that you have userdata/config/reports/html/suites_list.xsl. Now modify this copied file as needed. Edit the xsl files as desired. You can test your xsl at runtime by navigating to any existing logs and adding &type=mytype at the end of the log url. For example, click on the "Logs" link on the dashboard and drill down to any particular script report. This will show you your modified output according to the xsl in mytype folder. When ready with the correct XSL, open testrunner.bat or drun.bat and pass -logsInfo=mytype. You will now see the logs created according to your xsls. By default the suite report will be sorted by script STARTTIME, but if user wants to sort the suite report by SCRIPTNAME, follow the below steps. Take a backup of config/reports/html/suite_report.xsl. infoNOTE: There will be two occurences for Retrieve custom field value. Make sure you replace at both occurences. info NOTE: Add as many entries as there are custom fields. From Sahi Pro v7.5.0, user can set pass threshold percentage for Suite or Data Driven Suite. Suppose the user need to see log result as success for more than 75% in the scripts of a suite or dd.csv, then the user can set pass threshold percentage to 75%. Click the Configure link on Sahi dashbord and go to userdata properties. Then select sahi properties and search for sahi.pass_threshold_percentage. The default value is set to 100, update the value as required. Now in log result user will see reports as success, if scrips pass percentage is more than required value. The user can see the details of success and failure of all the scripts in suite report.